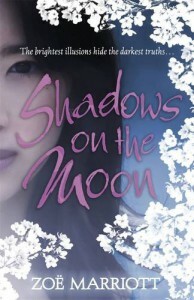 3.5 starsShadows on the Moon is a lovely retelling of Cinderella set in a magical version of feudal Japan. The Cinderella of this story, Suzume, witnesses the murder of her beloved father and cousin and barely avoids death herself. The traumatic event shatters Suzume and she compartmentalizes the broken pieces to survive.Marriott does an excellent job portraying Suzume's post traumatic stress disorder and the effects of suppressing emotions out of fear (or other reasons). The circumstances of the attack on her family aren't immediately clear and Suzume and her mother must assume new identities and a life in the protection of a close friend of her father. As Suzume begins to suspect their new protector of more sinister motives, it is even more important for Suzume to hide her true self and the fight for her life begins anew.During the initial attack on her family, Suzume was able to escape because of the manifestation of her shadow-weaving powers: the ability to manipulate her appearance to those around her. These abilities were fascinating to explore but I was frustrated at their lack of rules. It seemed to me that Suzume's skill level would increase exponentially whenever it was needed for the plot. Yet Shadows on the Moon is a fairy tale and so successful a one at that, I was able to make certain allowances I might not normally accept so easily.There are some truly special supporting characters in Youta and Akira, doing double duty as Suzume's fairy godmothers, and Otieno, Suzume's love interest and opposite in emotional honesty.At first the reader experiences the vivid terror, rage and grief with Suzume but as the story goes on, Suzume doesn't just suppress her feelings to others, she does to the readers as well. As a result, her narration has a serene, placid tone no matter what she is recounting to the reader. As Suzume's sole focus becomes vengeance it is both vindicating and heartbreaking. After enduring so many hardships, you want her to avenge her loved ones but you also want better things for her. When Suzume finally begins to unpack the feelings she's hidden away for so long and starts to heal it is a beautiful thing.Shadows on the Moon is a solid, if long, fairy tale retelling with moments of pure magic. 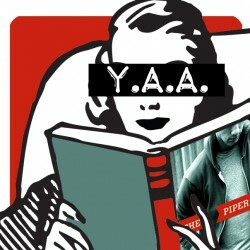 This review originally appeared on Young Adult Anonymous.